Today is our Everybody Art Challenge and this week we would like to see an "Envelope Card". This is the first time I've made this type of card and I really enjoyed it. It's also really easy to do and you only need 1 sheet of 12x12 paper for the main envelope shape. I would like to say that I created the fold but I didn't, instead I came across on the Wild Orchid Challenge blog and it was demonstrated by Anne Kristie. I have been seeing a lot of the digi images by Saturated Canary recently and just had to purchase some. This one is called Zorana Gipsy. Isn't the folds on her dress beautifully drawn.It definitely made it easier to colour. 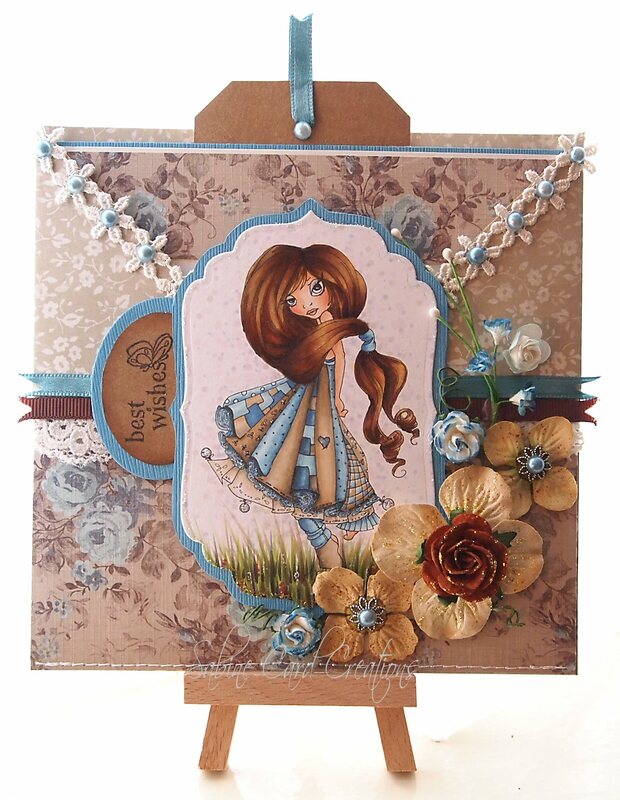 The paper is Ella Blue - Tina Higgins by GCD Studios and blue Bazzill card. Embellishments - Lace,ribbon, pearls coloured with Copics, Prima flowers highlighted with stickles glue and a few blue/white roses from Wild Orchid Crafts. The sentiment was a freebie stamp from a craft magazine early last year. Thanks for stopping by this week and keep crafting. Oh this is fabulous Jenny, love adorable image. Gorgeous colouring and such a beautiful image. Love the papers. wow beautiful card Sabine!!!! I love the sweet image !